how to modify offshore forecasts for coastal conditions. how to get the forecasts (SSB, satphone, Sailmail, etc.). Topics are arranged in order of decreasing “bang for the buck” or increasing return for increasing effort. e. Separate charts for percent of gales, fog, etc. c. Always cross-check with NWS forecast—at least some human has looked at the forecast! 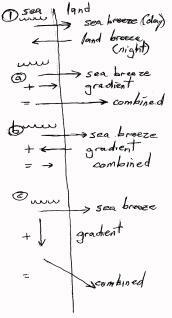 A short summary of information about breaking waves in shallow water. Whether a wave will break in shallow water is primarily a function of its height and of the water’s depth, though other influences apply. A consensus value for the critical depth that will cause breaking is 1.5x the wave height. · As waves move into shallow water, their height increases, reaching 1.33x the deep water height before breaking. èA sea state described as a certain significant wave height will begin to break when the water depth becomes less than about 2.5x the (deep-water) significant wave height. 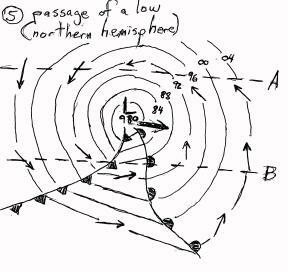 For example, a 25-knot breeze (force 6) can generate a significant wave height of about 12 feet. The highest 10% of the waves in the spectrum will average about 15 feet. As the 15-foot waves move into shallow water, they will grow to about 20 feet before breaking in water about 30 feet deep. A harbor entry with a 30-foot depth, or a 30-foot deep shoal, would have breakers. 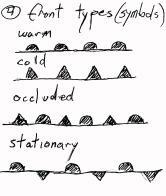 · When depth = length/3, the wave height and steepness (height/length) locally decrease slightly. 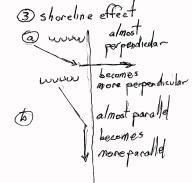 If you are paralleling a coast, you may be able to find a smooth avenue at the right distance off the beach, traveling on the surface above this depth contour. · When depth < length/4, the wave steepness climbs past its open-ocean value and continues to increase as depth decreases. · Also when depth < length/4, refraction begins. 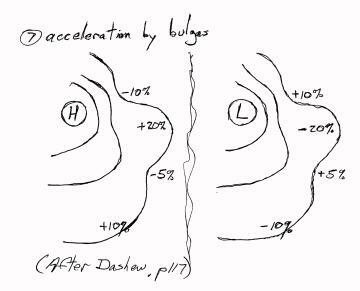 A convex depth boundary (e.g., a round shoal, or a river bar that sticks out like a tongue) will bend (focus) wave energy from either side into its center like a lens, causing breaking to occur over deeper water than otherwise. A concave boundary (e.g., a trough, or a deep river mouth with shoals on either side) will cause energy from the central axis to be drawn away to either side, reducing or postponing breaking. · Wind against current will cause steeper seas and earlier breaking. Entering a river mouth with an onshore wind should be done with a flood current if the situation is in doubt.